This entry was posted on June 29, 2013 by Phil Groom, in Distribution Services, News, Product News, Trade Notes and tagged Children's Resources, Friends and Heroes, Jellyfish Labs, What's in the Bible?. Bookmark the permalink. FRIENDS AND HEROES, publishers of the popular children’s DVD series of the same name, have lived up to their name by coming to the rescue of the Buck Denver asks… What’s in the Bible? series in the wake of David C Cook’s decision to drop Kingsway Distribution in the UK (reported last month: Kingsway to Quit Distribution). Today’s media-savvy kids are watching movies on TV, Computers, iPads, iPods, PlayStations and many other devices. We need more high quality Biblically-based productions to appeal to them. We have already been in an exciting partnership with What’s in the Bible? and Jellyfish Labs, promoting this outstanding resource to our existing customers for nearly two years. 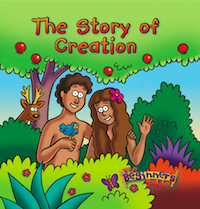 Becoming the main UK distributor will ensure quality Bible-based children’s DVDs get the profile they deserve.